Medical insurance – Brewer Science pays a significantly greater percentage of family health insurance premiums than the average company. Brewer Science’s health insurance coverage has a significantly lower deductible than most companies its size. Brewer Science provides an environment conducive to work-life balance and a benefits package that is difficult to find at other companies, including community service leave, wellness breaks and reimbursements, and a fitness room on premises, just to name a few. 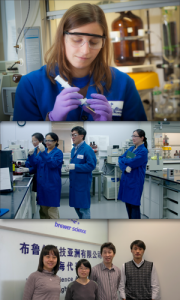 At Brewer Science you are part of a dynamic, growing, high-technology company, with unlimited opportunities for professional and personal advancement. As a Brewer Science employee, you have a chance to be an important part of a global company and to make a difference.